The 96Boards is based on the STMicroelectronics STM32F401RET Cortex-M4 CPU and also contains a nRF51822 chip connected over SPI for BLE connectivity. The 96b_carbon configuration is used when developing programs for the main chip on the board, the STM32F401RET. Users will likely want to write applications targeting this chip, using the 96b_carbon configuration, since it is connected to all of the breakout I/O headers. The 96b_carbon_nrf51 configuration should be used for programming the secondary nRF51822 chip. Most users will likely not develop applications for this chip, since Zephyr already provides a sample application that can be flashed onto the nRF51822 to provide Bluetooth functionality to applications on the main STM32F401RET chip. For instructions on how to set up the nRF51822 to develop Bluetooth applications, see Providing Bluetooth to 96b_carbon. After you have flashed your nRF51, you can perform basic validation of this Bluetooth setup using the instructions below. More details about the board can be found at 96Boards website. STM32F4 has two external oscillators. The frequency of the slow clock is 32.768 kHz. The frequency of the main clock is 16 MHz. 96Boards Carbon board has up to 4 U(S)ARTs. The Zephyr console output is assigned to USART1. Default settings are 115200 8N1. 96Boards Carbon board has a USB OTG dual-role device (DRD) controller that supports both device and host functions through its mini “OTG” USB connector. Only USB device functions are supported in Zephyr at the moment. There are 2 main entry points for flashing STM32F4X SoCs, one using the ROM bootloader, and another by using the SWD debug port (which requires additional hardware). Flashing using the ROM bootloader requires a special activation pattern, which can be triggered by using the BOOT0 pin. 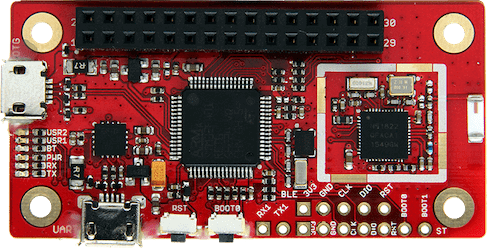 The ROM bootloader supports flashing via USB (DFU), UART, I2C and SPI. You can read more about how to enable and use the ROM bootloader by checking the application note AN2606, page 109. It is recommended to use at least v0.8 of dfu-util. The package available in debian/ubuntu can be quite old, so you might have to build dfu-util from source. Connect the micro-USB cable to the USB OTG Carbon port and to your computer. The board should power ON. Force the board into DFU mode by keeping the BOOT0 switch pressed while pressing and releasing the RST switch. Then build and flash an application. Here is an example for the Hello World application. Connect the micro-USB cable to the USB UART (FTDI) port and to your computer. Run your favorite terminal program to listen for output. Replace <tty_device> with the port where the board 96Boards Carbon can be found. For example, under Linux, /dev/ttyUSB0. The -b option sets baud rate ignoring the value from config. This section contains instructions for verifying basic Bluetooth functionality on the board. For help on Zephyr applications in general, see Build an Application. Flash the nRF51 with the hci_spi sample application as described in Providing Bluetooth to 96b_carbon. Install the dfu-util flashing app, as described above. Refer to the instructions in Bluetooth: IPSP Sample for how to verify functionality. Congratulations! Your 96Boards Carbon now has Bluetooth connectivity. Refer to Bluetooth for additional information on further Bluetooth application development. The 96b_carbon can be debugged by installing a 100 mil (0.1 inch) header into the header at the bottom right hand side of the board, and attaching an SWD debugger to the 3V3 (3.3V), GND, CLK, DIO, and RST pins on that header. Then apply power to the 96Boards Carbon via one of its USB connectors. You can now attach your debugger to the STM32F401RET using an SWD scan.